Universal gap filling adhesive. Especially suitable for bonding substrates that are sensitive to solvents i.e. expanded polystyrene, foamed and laminated PVC. Bonds wood, plasterboard, MDF, hardboard, ceramics, glass, metal, cork, laminates, uPVC, brick, breeze block, concrete, plastic. At least one surface should be porous. Internal use. 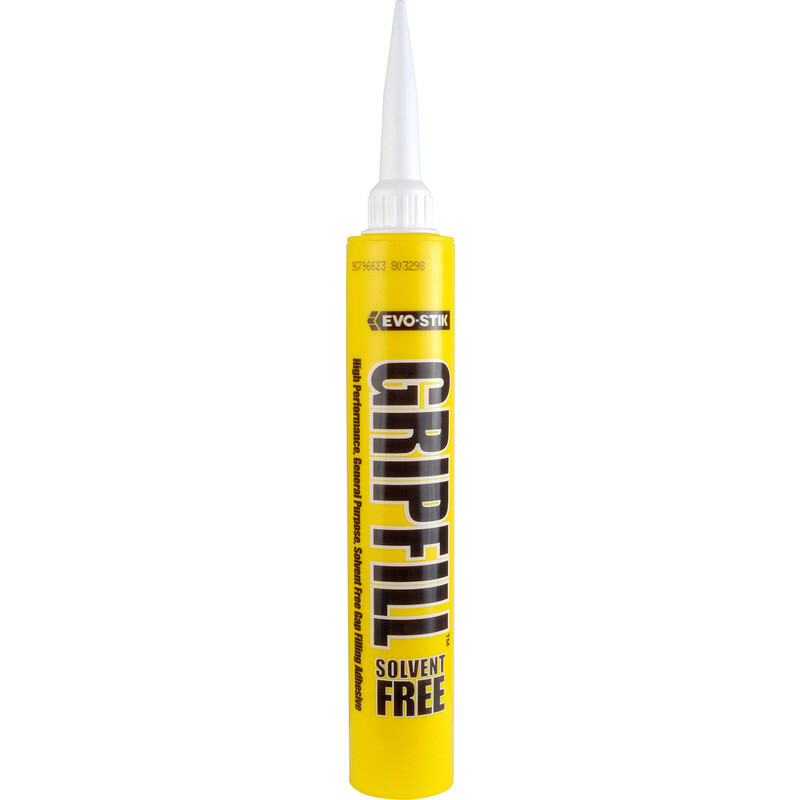 Gripfill Solvent Free 350ml is rated 4.0 out of 5 by 8. Rated 1 out of 5 by Anthony123 from lumpy I have used this adhesive for years but purchased through another online supplier. Never had a problem until now. Bought 4 tubes and so far 2 have had hard lumps which have stopped the adhesive flowing through the tube. Had to remove skirting length as it wouldn't hold flat to the wall only to find small hard lumps had found their way through the tube nozzle. Either a bad batch or TS have issues with storage conditions. Whatever the cause - I won't be buying from TS again maybe not from anyone. have given reduced rating as I am really hacked off. Rated 5 out of 5 by Brunel from Excellent product I have used this for years, mostly for dry-lining. It is perfect for bonding plasterboard, wood and brickwork. Rated 2 out of 5 by Norbert from Beware, Not Always Reliable. I bought 20 tubes of this stuff to put up plastic coving as recommended on the coving's sales page. It did not stick to the coving which fell down when the pins were removed. Rectification cost me a day and a half's work plus driving 30 miles to buy fresh adhesive and a derisory fob-off from Toolstation. It is described as "gap filling". Well, I suppose it is after a fashion but it shrinks and cracks even in small gaps. Emulsion paint goes to hairline cracks all over when painted too. My decorator warned me of this feature after I had ordered it so it isn't just me. Apparently this can be avoided by undercoating it with proper undercoat (not waterbased) first but that's a ludicrous situation. Not at all impressed. It hardens to rigid and I suspect this does not help it to adhere to the rather shiny surface of the coving as any shrinkage will break the already weak bond. I am sure it will work OK on porous surfaces (the product descripton alludes to this but only says one surface should be porous) but I'd avoid it altogether for non-porous materials but that really isn't an acceptable situation whan it is recommended for a purpose it is unsuited for - and there are doubtless many other situatuons where it will perform badly too. This needs to be flagged up. Rated 4 out of 5 by Monty 280 from Good value for most tasks. I had run out of my usual grab adhesive, but this was available thanks to Toolstations excellent opening hours. I appears to have done the job of sticking some thermal plasterboard to the wall however some skirting didn't hold as well as I had expected and had been left overnight under pressure to go off. Would use again for simple jobs. Rated 5 out of 5 by reluctantfemalediyer from Make all Gripfills with removable spout! Used for attaching coving, great as fills the gap (doesn't shrink) aswellas sticking it to the wall and ceiling! Easier to use than the green version, kept several spouts with different openings cut on spout, so interchangeable when glue-ing or filling - also, uncut spouts can seal tubes as you work.